AK8002 Water gel transparent 250 ml. 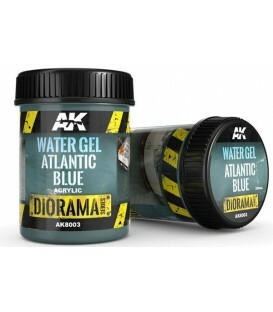 AK8003 Water gel Atlantic blue 250 ml. AK8004 Water gel Pacific blue 250 ml. AK8006 Water gel swamp green 250 ml. 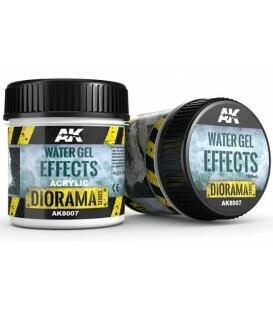 AK8007 Water gel effects 100 ml. AK8008 Still Water 250 ml. AK8009 Snow sprinkles 100 ml. AK8010 Snow microballoons 100 ml. AK8011 Terrains snow 250 ml. 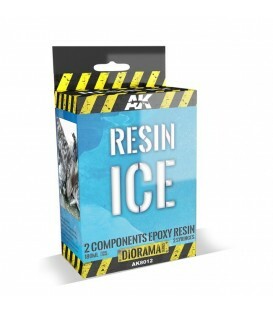 AK8012 RESIN ICE 2 components epoxy resin 150 ml. AK8013 Terrains asphalt 250 ml. AK8014 Terrains concrete 250 ml. AK8015 Terrains dry ground 250 ml. AK8016 Terrains wet ground 250 ml. 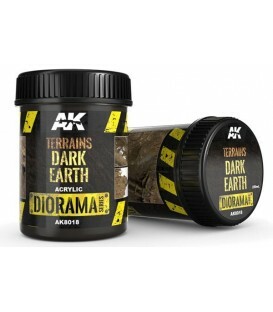 AK8018 Terrains dark earth 250 ml. AK8019 Terrains beach sand 250 ml. AK8020 Terrains desert sand 250 ml. AK8021 Terrains light earth 250 ml. AK8023 Terrains neutral texture for earth 250 ml. AK8025 Neutral texture for rough terrain 250 ml. AK8026 Splatter effects wet mud 100 ml. AK8027 Splatter effects dry mud 100 ml. AK8028 Puddles - Bassals 60 ml. AK8029 Splatter effects wet ground 100 ml. AK8030 Splatter effects stirred earth 100 ml. AK8031 Splatter effects accumulated dust 100 ml. AK8032 Dark and dry crackle effects 100 ml. AK8033 Light and dry crackle effects 100 ml. AK8034 Wet crackle effects 100 ml. 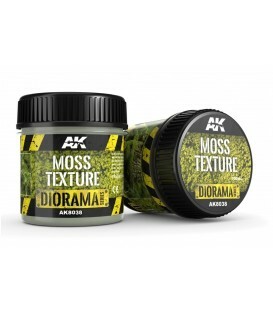 AK8038 Moss Texture 100 ml. Aquesta escuma mòlta de color és ideal per a l'aplicació de molsa, com la que es veu en zones forestals i humides, en vehicles abandonats, etc. També es pot utilitzar per a la creació d'arbres. AK8040 Corrosion texture 100 ml.